I finished the socks for my second Sockapalooza pal a couple of days ago. I wove in the ends and stuck them in some wool wash for a bath. When I pulled them out, I started to panic because they seemed a LOT SMALLER than they were when they went in. I've been afraid that they were too small all along, but now they definitely were. However, now that they've dried completely, they look to be not as small as I feared. The fabric doesn't feel as dense and unflexible as it was when they were wet. They're knit out of a bamboo-wool blend that I've never used before, so maybe the yarn swells a lot when it takes up water, but shrinks down again as it dries? I don't know. I've started a new pair for my pal just in case (made from Koigu--something I'm familiar with that won't play tricks on me!). I think I'll send her the pair I've completed, and then if they don't fit, I'll send her the second pair. 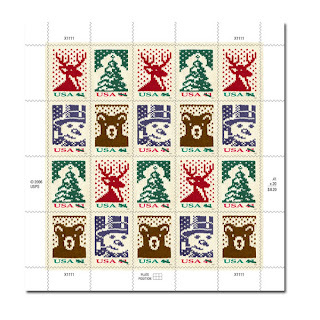 Some of the Holiday Stamps that the USPS is putting out this year are titled "Holiday Knits". They're pretty, but not quite what I was expecting when I read the name. I was thinking that there were going to be some pretty stranded-knitting mittens and scarves and hats and stockings. I still think that I'll buy a booklet for my Christmas cards, but I'm not quite as exuberant about them as I was before I realized what they look like. Speaking of knitting, I've got a bad case of Startitis. I'm just about done turning the heel on the second Sockapalooza sock; I'm just over half-way done with the cabling on the Tangled Yoke Cardigan; and now I've started a scarf for my roommate and a pair of socks for me. I've got good excuses: the scarf for my roommate features GLOW IN THE DARK YARN (I couldn't hold off any longer) and I needed some plain stockinette to knit while I do homework. And my fingers are itching to start more. I have a response paper due on Monday, which means that I've been reading, and that means I've been working on my Tangled Yoke cardigan! I've got a couple more rows to go, and then I'll start doing the decreases and cables section. Because I can't read and knit cables at the same time, this won't be my homework project anymore. I think I'll have to start a plain pair of socks. I'd like another sweater, but I don't have a sweater's worth of yarn in my stash or the money set aside to buy that much. But I think I have enough sock yarn for five or six pairs. Speaking of socks, I'm probably 2/3 done with the first sock for my Sockapalooza pal. I'm a little concerned that they'll be too small when putting them on over the heel--my pal has feet just a little bigger than mine, and it's a mite snug when I try them on....I guess we'll see what happens. I'm zipping right along on the VogOn socks for my sockapalooza pal. I'm still quite enamoured with this yarn and pattern. These socks are knitting up so quickly. I've turned the heel and am working on the heel flap. I think what I'm doing is the Eye of Partridge heel, but I haven't done enough rows to be able to really see the pattern yet. I got a package in the mail this week from KnitPicks with my first-ever set of KnitPicks needles. I've been wanting to try these ever since they came out, but I haven't done it until now. I've only tried the 16-inch 2.25mm needles so far, and I like them a lot. They are sharp, but the points don't hurt my fingers as much as the AddiTurbo Lace Needles I have. I've never knit with 16-inch needles before, though, and it's taking me some time to get used to the shorter length of the needles themselves. I think I will be asking my family for the Nickel-plated Options set for my birthday or Christmas this year. I was THISCLOSE to getting a new car this week. The insurance appraiser that came out to look at my car told me that if there had been any more damage to it, they would have just written it off as totaled and given me the value to put toward a new car. That was such a strange statement to me. The word "totaled" brings to mind a car damaged and mangled beyond repair. Mine still works fine, it's just that the left blinker is smashed out and the hood and bumper are dented quite a bit. The issue is that I drive a car that's 12 years old and has nearly 265k miles on it (you gotta love them Toyotas! ), so the cost of repairs is coming awfully close to the value of the car. As much as a new car would be nice, I'm glad that I can keep this one--it's all paid for! Not that they would have given me much toward a new car anyway. On the knitting front, I finished the socks for my brother last night. I think they look pretty good, if I do say so myself! I immediately cast on for my Sockapalooza socks, but I wasn't really happy with how it was looking. On my lunch hour, I ran over to Magpie Yarn (which isn't too far from where I work) and browsed their sock yarn selection. I decided to try some of Crystal Palace Yarn's Panda Wool, which is a blend of bamboo, wool, and nylon. So far, I LOVE IT! Normally, I go for yarn that is more "squishy" like Koigu or Cherry Tree Hill, but I'm pleased with this yarn. It feels nice when I knit with it, and the resulting fabric is soft--much more so than you'd imagine just feeling it in a ball. It's knitting up nicely in the Vog On lace pattern and the colors are beautiful, although not as loud as they look in the photo below. The colorway is called "Red Cinnamon" and it's got red and orange and brown and magenta in it. It reminds me a lot of the colors of the leaves in fall. I might have to go back and snag a couple of balls for myself. One thing to know about this yarn, however: gauge is going to be misleading. You might be spot on for your gauge swatch, but go down a size or two anyway because the resulting fabric is really stretchy.